To some, Star Wars is nothing more than blasters and lightsabers. While that is perfectly okay, for some of us Star Wars is so much more. It is a lifestyle and a fandom that defines our very existence. At some point in our lives, we made the choice to engrave Star Wars into our hearts. This choice is essential not just because it shaped our lives, but also because choices are one of the most important and essential aspects of the saga. While this can likely be said for almost any story, because choices are what cause change, in Star Wars it means something more. What brought this to mind was a recent episode of Star Wars Rebels wherein Rex said, “We all have a choice.” He was reacting to Kanan describing the happenings of Order 66, where his master was killed by clone troopers who were deemed to have no choice due to the chip in their heads. Yet Rex, to most fans the ultimate clone, contradicts this by saying that the clones really did have a choice. Now, we know that the clones truly did have a chip in their heads that triggered them to turn on their Jedi generals. Along with that, we don’t know what happened to most of the clones once the chips were discovered (see: Clone Wars: The Lost Missions). But we can speculate based on the context clues that we are given. Due to Rex saying they “all” had a choice, we can assume that word about the chip in the clones was spread and a majority of them decided not to do anything about it. They made a choice to not believe their brothers and leaders, and as a result they changed the face of the galaxy. This is but one instance where the choices of a few shaped the galaxy, and it speaks to our very real world experiences. Every choice we make seems to have an impact far beyond our reach. As the Gungans and the Naboo, every choice we make has a butterfly effect. Star Wars gives us a useful lens into finding and understanding about this. Lando Calrissian, charismatic smuggler and suave professional, had apparently no choice with regards to turning Han and Leia over to the Empire. Yet if we are to take Rex at his word, and I believe we should since we have spent more time with him (in canon) and know that he is a man of trustworthy status, then Lando truly did have a choice. It just might have been a choice between two undesirable scenarios. Eventually, Lando redeems himself and makes the choice to save Leia and her companions, and even chooses to help save Han and lead the attack on the Second Death Star. Looking into other areas of the story of Star Wars, we can see that choice really is something we all have. Anakin had to make the choice between Mace Windu and Chancellor Palpatine. Luke chose to go with Obi-Wan. Han chose to come back at the Battle of Yavin. Kanan chose to reveal himself as a Jedi to protect those he cares about. Qui-Gon chooses to save Anakin from slavery. As an elementary school teacher, I see students act as if they have no choice quite often. When asked what they were doing in a given situation, most of the time said student will try to push blame off onto someone else. They do not do this maliciously, but rather as a form of self-preservation. Nonetheless, I always discuss with them that they are the only ones who control their actions and therefore they always have a choice. Why, then, has the phrase “I had no choice” become part of our lexicon? It goes back to exactly what I said about my students. Part of our jobs as human being is to preserve our existence. It is at the most instinctual level of any being. In Maslow’s Hierarchy of Needs, the two base levels are physiological well-being and then safety/security. Basically this means we must first have the food and shelter necessary for basic maintenance and then we must be able to keep ourselves at a base level of health (aka not dying from unnatural causes). In essence, this tells us that once we have achieved the basic things necessary to stay alive, our goal then becomes not to lose those things. To maintain the status quo. Considering this, it is easy to see why “I had no choice” has become a cornerstone of our vernacular. It pushes blame away from ourselves and onto someone or something else, as Lando does with the Empire, and ergo we are able to, at the very least, hold onto the things we have. In the case of Lando in particular, he has gone from a gambler and “entrepreneur” to a respected business man. His new status quo is Cloud City. It is what provides him food, shelter, and protection. That is until it doesn’t. We can empathize with Lando. I cannot sit write this without admitting that, were Darth Vader to invade my home, I probably would have acted in the same manner. I believe many of you would agree with this statement. 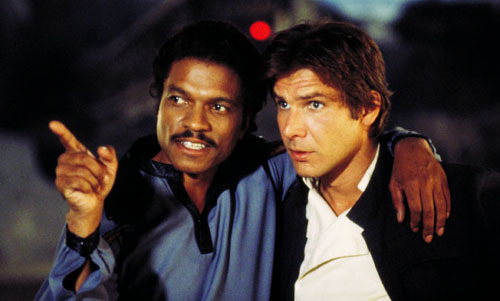 Nonetheless, the reality is that Lando did have a choice; Luke Skywalker shows us that. Luke bucked the Hierarchy of Needs. He showed us that no matter the circumstance, we always have a choice. When he threw away his lightsaber on the Second Death Star, he essentially was saying that another person’s need to be brought back from the darkest shadows of existence was more important even than his own life. When he is being hit with Force lightning by the Emperor, he does beg his father to save him. Yet it is arguable that he does so not so much for himself, but rather to redeem Vader. If he had been putting his own needs above those of the galaxy, he never would have tossed his lightsaber aside. He either would have kept on fighting until he killed Vader and the Emperor or died himself, or he would have completed his turn to the Dark Side and become the apprentice of Palpatine. Regardless, Luke had a choice. We all, as Rex so eloquently stated, have a choice. It will not always be easy to make our choices, and more often than not those that really matter are the most difficult to make. But when it comes right down to it, we can, like Luke, choose death rather than something that we do not believe to be right for ourselves or our world. Brandon Boylan can be found at https://fanboyfistpump.wordpress.com/ and @DarthBoylan on Twitter. Next article New 'Star Wars: The Force Awakens' Featurette, Plus Poe's Character Poster Revealed! This is a very good insight. If Star Wars has a recurrent theme, it’s that people are not driven by destiny, good or bad. It seems simple, but is at the heart of human questioning of existence. I (obviously) agree. The hardest part is really not allowing ourselves to make excuses to avoid making the decision. But at the same time, we have to consider how our actions impact the lives of others, because we don’t know what he/she might be going through. Great read! I love your intuitive look into the saga. Choices are truly important as they shape who we are AND impact those around us.